To alleviate the need for a new thread every time there is a news article released on the F-35 please post any news in this thread. Weapons Delivery Accuracy (WDA) flight tests began in July 2013 and testing wrapped up earlier this month. 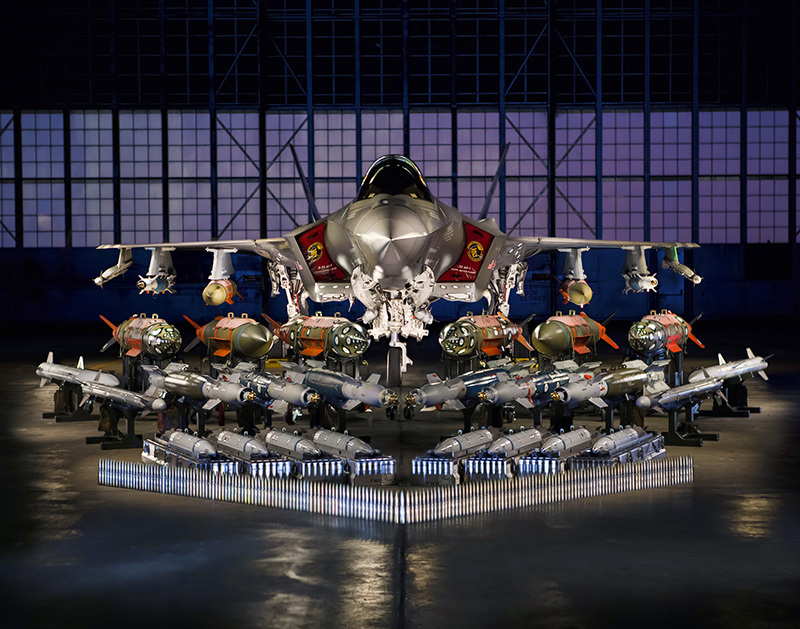 The WDA portion of the F-35 developmental test and evaluation mission ensures the fifth-generation fighter’s weapons system can deliver lethal ordnance both air-to-air and air-to-ground using the jet’s warfighting Block 3F software. Hamilton said the air-to-air accuracy tests finished in August with air-to-ground tests ending in October. The F-35 ITF then capped off WDA tests by completing testing on the F-35’s GAU-22 25mm gun at the beginning of December. The WDA gun tests included the Air Force’s A variant where the gun is internal carried and on the Marine Corps’ and Navy’s B and C variants, which employ a gun pod beneath the jet. Maj. Jonathan Gilbert, 461st FLTS, completed the final air-to-ground WDA test as a new test pilot to the F-35 Integrated Test Force. “When they get their 3F software, the one that is going to be productionized for full 3F capability, [the fleet] will be confident they can load these weapons and drop them on the target they’re selecting,” Hamilton said. The Air Force has selected Truax Field Air National Guard Base, Wisconsin and Dannelly Field, Alabama as the preferred locations for the next two Air National Guard F-35A bases. On Friday, December 15, Lockheed Martin (NYSE: LMT) delivered the 66th F-35 aircraft for the year, meeting the joint government and industry delivery target for 2017. To date, more than 265 F-35 aircraft have been delivered to U.S. and international customers. More than 530 pilots and nearly 5,000 maintainers have been trained, and the F-35 fleet has surpassed more than 115,000 cumulative flight hours. "Meeting our 2017 delivery commitment is a testament to the hard work and dedication of our joint government and industry team to deliver the transformational F-35 air system to the warfighter," said Lockheed Martin Executive Vice President and F-35 Program General Manager Jeff Babione. "The team continues to overcome program challenges and achieving this milestone gives our customers confidence that the F-35 enterprise can deliver on the increasing production quantities year-over-year." Sixty-six F-35 deliveries in 2017 represents more than a 40 percent increase from 2016, and the F-35 enterprise is prepared to increase production volume year-over-year to hit full rate of approximately 160 aircraft in 2023. South Korea plans to buy an additional 20 F-35A stealth fighter aircraft from the United States, a South Korean newspaper reported on Thursday, less than two months after U.S. President Donald Trump announced Seoul would be purchasing billions of dollars in new military equipment. South Korea’s Defence Acquisition Program Administration has established a process for procuring the 20 additional aircraft, the Joongang Ilbo newspaper reported, citing multiple government sources. In 2014 South Korea formally announced a plan to buy 40 F-35As from American defense contractor Lockheed Martin. A new cost estimate on F-35 concurrency reveals a 24 percent drop or a reduction of $400 million over an 11-month period. Two primary factors have driven the cost-estimate reduction. The first is due to the removal of third-life testing teardown and inspection because that activity occurs at the end of the system development and demonstration phase, while the second component is attributed to originally forecasted issues that did not occur, according to F-35 spokeswoman Brandi Schiff. The F-35 joint program office considers SDD completed, however, a new strategy was established called continuous capability development and delivery to give the program a mechanism to correct deficiencies. Specifically, a September report to Congress notes third-life teardown and inspection costs have decreased by 89.7 percent or from $390 million to $40 million, which is beyond the scope of the concurrency efforts. The F-35 joint program office is mandated by Congress to submit a semi-annual report on concurrency cost. "Concurrency is a temporal issue and as we complete more and more testing, the risks and impact of concurrency will decline," Schiff wrote in a Dec. 20 statement to Inside Defense. "The majority of technical risks that drive changes and costs will have been discovered." For instance, in the most recent concurrency report to Congress the number of forecasted issues and known issues is leveling out, which is due to design maturation, according to Schiff. "The Department of Defense established the F-35 program with a planned amount of overlap between the development and production of aircraft," Schiff wrote. "These concurrent actions led to aircraft built during early production lots to undergo modifications due to discoveries made during qualification, flight, and ground tests, or as a result of engineering analysis." The Pentagon incentivized both Lockheed Martin and Pratt & Whitney by sharing the costs to incorporate concurrency changes as soon as possible in the production line. Additionally, the JPO established a "Modifications War Room" that develops and maintains a comprehensive modification database for strategic planning, according to Schiff. Inside Defense reported in May 2015 the F-35 concurrency cost estimate increased by about 2 percent compared to the previous year's figure. The increase came after two consecutive years of declining concurrency-cost estimates. Where Does Lockheed Martin's F-35 Program Stand As Of Now? The F-35 program is the most expensive military weapons system in history and has, hence, had its fair share of critics. Since the beginning, people have argued that the plane has many design flaws that have led to heavy additional costs and significant delays in the development process. Many have blamed the procurement process in which Lockheed was allowed to design, test, and produce the aircraft all at once, instead of first identifying the defects before starting production. In 2016, even President Trump took to Twitter to publicly announce his reservations regarding the program's "mounting costs." However, despite all the obstacles, Lockheed Martin's ( LMT ) F-35 has emerged victorious, as is evidenced by this year's performance. In the year, the program managed to meet its target of producing 66 aircraft for the Pentagon and its allies, despite production problems that stalled manufacturing for an entire month. In the months of September and October, the U.S. DoD was forced to halt shipments for F-35s for 30 days after a production error that enabled corrosion to form around the fasteners attaching body panels to the airframe. However, despite this, the company managed to deliver about 40% more aircraft year-over-year. This goes to show the company's resilience in upping production in light of heavier demand, while showing critics that it is more determined to make ends meet. If the deals went through, they would bring significant capability upgrades among Gulf Cooperation Council countries, and would mark Lockheed Martin’s first F-35 sale for that market. But such a sale would have to jump through significant hoops before it was approved, said Derek Bisaccio, military markets analyst at Forecast International, a Newtown, Connecticut-based market consulting firm. Although the F-35 Joint Strike Fighter is not slated to enter full-rate production until the mid-2020s, the Pentagon's deputy secretary of defense wants the program to operate as though it is already producing at full capacity. "When you look at the volume of work that we're doing, we're not at low-rate production," Pat Shanahan said at a Dec. 21 media briefing. "We should be translating in terms of the processes and capability to the mindset of, 'We're at full rate.'" At the outset of the F-35 Joint Strike Fighter program, there were high expectations that it would benefit from lessons learned from its elder stablemate, the F-22 Raptor, also made by Lockheed Martin. Now, a dozen years after the F-22’s operational debut and two years after the F-35 was declared ready for combat, the flow of lessons learned is running both ways. The two fifth generation fighter programs are working together to reduce costs and make both systems more effective. The F-22 has been a pathfinder for the F-35: Its formations and methods of employment are a model for the junior fighter. In return, the small F-22 fleet is gaining economy-of-scale benefits by getting in on parts buys with the far larger—and growing—F-35 fleet. More advanced and hardier stealth features on the F-35 are working their way back to the F-22, the two aircraft share radar features, and operational and manufacturing experience with the F-35 are helping define upgrades for the Raptor. The F-22 pioneered fifth generation tactics and those are being applied straight to the F-35, according to Col. Paul “Max” Moga, commander of the 33rd Fighter Wing at Eglin AFB, Fla. The 33rd trains new F-35 pilots, but Moga spent years in the F-22, as an instructor and demonstration pilot and later as a squadron commander, after starting out in F-15s. Regarding employment techniques on the F-22 and F-35, “I would describe them as a direct transfer,” Moga said. In the F-22, the key to employment is “managing signature, sensor, and what we refer to as ‘flow,’ ” which he explained is how the plane and pilot sense the battlespace, steer between threats, and get into the optimum position to engage. That same concept applies to the F-35, he said. Though fourth generation aircraft pilots have to manage visual and infrared signatures, “it’s not until you get in the fifth gen world that you really concern yourselves with radar signature management. … That is a core competency of any fifth gen platform, and that is a direct transfer over from the F-22 to the F-35.” Pilots of both jets must “manage our signature as we employ the aircraft and optimize our survivability and lethality,” Moga said. The F-22 was a “generational leap” over fourth gen fighters such as the F-15 and F-16, and it took a conscious shift in culture to shed old tactics that were no longer relevant when the F-22 came online, he noted. In a fourth generation jet, a wingman must provide “mutual support” within visual range, “welded” to the flight lead just a few miles away. But “pretty early on in Raptor tactics development, we realized that, based on the capabilities of the airplane, we didn’t need visual mutual support. We needed a mutual support by presence, which, for us, can be upward of 10, 15, 20 nautical miles away from one another,” said Moga. For a former fourth gen pilot who has always depended on someone close by having his back, “it takes a while to get used to that,” Moga said. A LOT more info at the above link but in short the F-35 appears to be the best thing that has happened to improve F-22 capability and especially sustainability. In what could be a major change in Japan’s policy on aircraft carriers, the Defense Ministry is mulling a plan to buy F-35B stealth fighter jets for use on its helicopter carriers, government sources said. The introduction of F-35Bs, which have short takeoff/vertical landing (STOVL) capability, will be useful in countering China’s growing maritime assertiveness. They are expected to bolster Japan’s ability to defend far-flung islands in the southwest, where only short runways exist, the sources said Sunday. Agree. Assuming it is the Izumo class they are talking about it won't carry a large number of aircraft but may be enough to maintain a self defence and small offensive capability. The Izumo are longer than the Juan Carlos but shorter than a WASP LHD. The lengths of the respective STOL/LHD carriers around the world can be seen below. Both the American vessels will obviously carry F-35, the Spanish Juan Carlos LHDs, which includes Spain, Australia and soon Turkey, are capable of F-35 ops, the Italians are planning F-35B off the Cavour and now the Japanese potentially from Izumo. The South Korean Dokdo are small (short and the deck layout doesn;t look conducive to STOVL aircraft operation) so unlikely to operate F-35B. I can't see Thailand operating any VTOL aircraft in the future given I don't believe their vessel has left harbour in over six years. Correct, Australia currently has no intention to operate the Canberra Class LHDs as STOVL carriers. There is no technical reason they can't, just a political decision not to. The vessels in Australian service have a very specific mission they are slated for with no current intention to operate fixed wing aircraft. When Australia evaluates the SH replacement in 2023 there is a possibility they will look at F-35B and the Canberra's again but I would expect Blk 5 F-35As as the likely choice to bring the RAAF fighter fleet to a single platform (which had always been the intention anyway). As North Korea works toward building out its missile technology to put the US mainland in range of its nuclear arsenal, the F-35’s new air target may be a missile, not a fighter. According to Justin Bronk, an expert on aerial combat at the Royal United Services Institute, the missiles already aboard the F-35 just need a slight tweak to start taking on missiles. “By changing the firmware a bit, tweaking it a bit, you could gain a theoretical” capability to engage ballistic missiles, Bronk told Business Insider. A source involved in ballistic-missile defence at the Pentagon confirmed Bronk’s statement. Basically, the F-35 and its AIM-120 air-to-air missile stand a few wires away from potentially being able to disrupt North Korea’s next missile test, but there’s a catch. BAE Systems, Northrop Grumman (NYSE: NOC) and the U.K. defense electronics and components agency have jointly received the top honor during the Minister for Defense Procurement Acquisition Awards ceremony for their work on the F-35 program in the country, GovCon Executive reported Wednesday. Northrop said Dec. 21 the U.K. defense ministry recognized the government-industry partnership called Sealand Support Services Limited as a key factor in the F-35 Joint Program Office’s selection of the country as a global provider of maintenance, repair, overhaul and upgrade services for depot-level repairable components of the F-35 air vehicle. is getting offered a multiyear block buy for its F-35 aircraft in exchange for not objecting to its rival getting new orders from the Navy for the F/A-18 fighter, according to a report. “It is common knowledge within the defense industry that Lockheed Martin employees are not to complain about the Navy‘s plans to purchase another batch of Boeing F/A-18 Super Hornets because of a deal worked out by the president to push for a multiyear block buy of Lockheed Martin F-35s,” Dan Grazier, a defense industry expert at the Washington watchdog group , wrote in a blog post Monday. A Lockheed spokesman called the report “100 percent false.” Boeing and the Pentagon declined comment for this story. Analysts have previously said a multiyear block buy could help Lockheed change the economics on the aircraft and help improve margins and lower costs. It also would give the company more leverage with its partner companies and supply base by providing a steady flow of work over several years. It will be interesting to see what happens with the B once the UK gets the SRVL working. I could see that capability make the B variant a lot more interesting to smaller operators. A high performance multi role stealth jet with the ability to operate pretty much anywhere. Doubly interesting for smaller countries that work with the concept of dispersing aircraft to operate on roads and other austere areas. Also good to see following the rebaselining the F-35 seems to be on budget and on time. Pre rebaselining will forever be an example of project mismanagement but the leadership team really seems to have recovered from that mess. Lockheed Martin has an interesting graphic displayed on their website showing the comparative max load-outs for stealth combat configuration and for non-stealth combat configuration—the latter of which the company refers to as "beast mode." In the "beast mode" configuration, the graphic depicts an air-to-air optimized load-out that includes a whopping 14 AIM-120 AMRAAMs and a pair of AIM-9X Sidewinder missiles—16 missiles in all. But does such a plentiful missile carrying configuration actually exist? The primary F-35 jet is being examined at Eielson Air Pressure Base. The Fairbanks space is getting ready for a inhabitants soar. The first F-35A Lightning II fighter jet has landed at Eielson Air Force Base and will spend much of November going through testing to ensure it can operate on an icy runway in frigid Interior Alaska. “They‘re going 150 miles per hour down the runway, hitting the patch of ice and making sure they can still keep it under control,” said 2nd Lt. Kitsana Dounglomchan, a public affairs officer on the base southeast of Fairbanks. The F-35 arrived at Eielson last month. It‘s the to bring 54 of the new F-35 stealth fighters to Eielson. The F-35 is the military‘s most advanced jet yet, and also its most expensive. Eielson‘s batch of the radar-evading planes will start arriving in April 2020. With them will come about 3,500 people, including airmen, contractors and family members, most of whom are expected to settle in nearby North Pole, said Kevin Blanchard, who directs the 354th Fighter Wing‘s F-35 Program Integration Office at Eielson. Blanchard said he expects the first wave of new military personnel to arrive at the base between October 2018 and September 2019, followed by even larger groups in 2020 and 2021. He said the F-35 program will increase the number of military personnel at Eielson by about 50 percent, a significant change for a base once on the brink of closure. Plus, he said, the program will also bring more money and jobs to a state in a recession. “I think people see this as a boon to Fairbanks,” Blanchard said. This is a process called Shipborne Rolling Vertical Landing. It is a process designed to land jump-jet aircraft that uses both the vertical thrust from the jet engine and lift from the wings, thus maximising the payload an aircraft can return with and stopping the financial waste that comes with dropping expensive weaponry in the sea in order to land vertically. SRVL landing is under development for use with the F-35B when it enters service with the Royal Navy in 2018. Rolling landings will enable the F-35B to land on these carriers with an increased weapon and fuel load and will use the aircraft’s computer controlled disc brakes. Indeed, in the last 6 years countless DOT&E reports claimed late delivery and increased cost yet the program kept to time and within threshold costs since the rebaseline. Impressive leadership primarily by Bogdan and impressive work by LM and the JPO after what I agree was an initial trainwreck. And I do believe it is in it's design parameters. And just for fun, I found this and think it is interesting enough to post here, others who know more than I can tell me if it is useful or useless. Correct, another image which is from 2011. The Drive is pretty low on editorial credibility though, the site is very focused on click bait articles, so I don't put a lot of stock in their info but I am trying to post all articles here in the thread, not just positive ones or those from credible sites. and this one which shows the plan for Blk 4 weapons integration. The below is old and has changed though the JPO appears to have received permission to start Blk 4 work immediately and not wait for formal OT&E certification. Much of the weapon integration work can be done now and it seems pointless to wait until a formal Blk 4 window opens. A decent overview although some stuff in there that is now outdated, I'm also not a fan of drag calculations like that, too many assumptions. Oh my god this article is so old, we saw this at work almost a year ago. Why is this just now coming to the surface? One of the advantages of having built a digital thread manufacturing line for the F-35 at Fort Worth is the capability which the system allows to add evolving digital capabilities to that line. An F-35 Joint Strike Fighter would be able to use its sensors, weapons and computer technology to destroy Russian and Chinese 5th-Generation Stealth fighters in a high-end combat fight, some service officials said. “There is nothing that I have seen from maneuvering an F-35 in a tactical environment that leads me to assume that there is any other airplane I would rather be in. I feel completely comfortable and confident in taking that airplane into any combat environment,” Lt. Col. Matt Hayden, 56th Fighter Wing, Chief of Safety, Luke AFB, Arizona, told Scout Warrior in a special pilot interview last year. Japan's Defense Ministry is reportedly mulling a plan to purchase additional F-35 stealth fighter jets to replace other aircraft in its Air Self-Defense Force (JASDF). ​Japan's Mainichi Shimbun daily reported on Sunday that the ministry is considering the plan to buy dozens of more F-35s to replace the JASDF fleet such as the Boeing F-15 Eagle. ​The reported move comes after United States President Donald Trump urged Japan to purchase more of the aircraft during his trip to Japan last month, saying "it's a lot of jobs for the U.S. and a lot of safety for Japan." ​Japan, which has already been purchasing 42 F-35As from Lockheed Martin, is reportedly considering buying F-35Bs, which are capable of short takeoffs and vertical landings. Just clickbait. Tyler Rogoway used to write some half decent stuff but has moved more to this pulp in the last few years. Over at The Diplomat, Bob Farley, also a prominent co-star in the long-running Lawyers, Guns, and Money show, hips us to the latest on another one of the shebeen’s obsessions: the F-35B Flying Swiss Army Knife, the new strike fighter known for having every glitch and gremlin save the hair one that William Shatner sees out of the airliner window in that Twilight Zone episode. It appears that the militaries of foreign lands are curious about what other uses can be devised for the FSAK to fail at. The author of the piece (certainly cannot be called an article) sounds mostly like a moron. He appears to be be most upset that more militaries are taking an interested in the F35 and want to include it in their fleets and forces. The footage below, filmed from a unique viewpoint by Chopperguy, shows four F-35As belonging to the 62nd Fighter Squadron, 56th Fighter Wing, from Luke Air Force Base, Arizona, conducting the Fiesta Bowl Parade flyover at the University of Phoenix Stadium in Glendale, Arizona. on Dec. 30, 2017. The British Royal Air Force (RAF) and the Royal Navy have visited the 48th Munitions Squadron (MUNS) at RAF Lakenheath, UK, to attain a better understanding of the Guided Bomb Unit (GBU) 12 Paveway II weapon. The airforce and the navy intend to use the GBU-12 on the future F-35B Lightning II aircraft. The GBU-12 is a laser-guided 500lb bomb that the 48th MUNS uses on its F-15 platforms. The weapon is already used by the RAF on other aircraft. Disassembling a GBU-12, the airmen from the 48th MUNS provided the RAF with necessary information about the training programme used to ensure that the Liberty wing munitions Airmen are mission ready. Royal Navy Lightning Project Team Support Authority chief petty officer Taff Moult said: “The issue we found ourselves in was that we will be using GBU-12 munitions for the F-35. Moult added: “We think this is something we can build toward and, in the future, we can work together and have more joint training opportunities centred around the F-35. Weighing 800lb, the 129in-long GBU-12 Paveway II-guided weapon features improved detector optics and housing made of injection-moulded plastic, improved detector sensitivity, and minimum thermal battery delay after release. It also includes higher maximum canard deflection, laser coding, folding wings for carriage, and enhanced detector field of view. The instantaneous field of view of Paveway II is 30% greater than that of the Paveway I’s field of view. The Air Force is finalizing a high-tech “flight plan” for Intelligence, Surveillance, and Reconnaissance investments, the deputy chief of staff for ISR said here. The service can’t keep buying more and more drones to collect more and more data and then hiring more and more human analysts to plow through it, Lt. Gen. Veralinn “Dash” Jamieson told a small group. So the new strategy will make better use of satellites, cyberspace, advanced aircraft like the F-35 and B-21, and even publicly available information on the Internet, as well as artificial intelligence to help analyze the vast amounts of incoming data. Article is in Turkish but the below is a small snapshot via google translate. Appears that Turkey is still moving forward domestically with F-35 local contracts being released. The Undersecretariat of Defense Industry under the Ministry of National Defense has been linked to the Presidency with the decree of last law issued under the OHAL. The first tender was opened for F-35 warplanes. Deadline for bidding for the project is 28 February. The project aims to secure information exchange between the Air Force Information System and the Turkish Armed Forces inventory, which is expected to enter the F-35 this year. The system to be set up will ensure that classified information is transferred from the headquarters to the new generation of jets and jets in a safe and controlled manner. Deadline for bidding for the project is 28 February. There has been a significant amount of recent media attention on the possibility of Japan acquiring the F-35B Short Take-Off and Vertical Landing (STOVL) variant to operate from their helicopter carriers. As a result, I have seen renewed speculation as to whether Australia will also expand its current purchase order for F-35A (conventional) to include some of the F-35B models. A few years back, I was fortunate enough to undertake the Royal Canadian Air Force's (RCAF) Aerospace Systems Course (ASC). As part of the course, I wrote a research paper on this exact topic and feel that it may be poignant to once again address the major points within that. This will require hanging multiple missile on each hardpoint. I don't think that such a thing is developed for the F-35 as of now. Hopefully it will come. Hey, Siri, How Do You Fly An F-35? The article is more about VR training of aircrew and the potential to replace some components of the flight training syllabus than about the F-35. Even as the turbulence in the wake of the purchase of the Rafale fourth generation fighter dies down for the moment with about half-a-dozen figures tossed around for what it costs per aircraft, it becomes incumbent upon the government to give another fighter a shot. Not only will it change the big picture dramatically, it will also give New Delhi an opportunity to truly test its relationship with the US and see if it really counts to be one of the two biggest democracies in the world. The fifth-generation F-35 Joint Strike Fighter will make every fighter in the market obsolete. It is so advanced and ahead of the game that it is referred to as an integrated air system predicated to avionics, weaponry, propulsion and logistics and not a fighter. It does not matter whether an air force has a Rafale, an F-16, Sukhois, the Swedish Gripen, the Eurofighter or a Mirage. None of these fighters can even come close to the F-35 whose weapon system can find targets 2,000 km away. In fact, after US President Donald Trump demanded a trimming of the cost of the F-35 by 10 percent earlier this year and forced Lockheed Martin to redo its sums, the aircraft is coming in at $86 million per unit, which is less than what is being paid for conventional fighters. And it is far less than the Rafale which is way north of the $100-million mark. Shares of Lockheed Martin (NYSE:LMT) rocketed 28.5% higher in 2017 as the entire defense sector rallied on President Donald Trump's promise to boost military spending and on growing concern from overseas threats. Lockheed in particular stood out thanks to the progress it has made bringing its F-35 fighter jet to market, a plane that is expected to become the most lucrative weapons platform ever developed. Lockheed had been a company in transition for the last few years, integrating its 2015 $9 billion acquisition of helicopter-maker Sikorsky while trying to work out kinks in the F-35 ramp-up. The company has spent more than 10 years developing the plane, dogging initial critical performance reviews and surviving cost overruns, but the F-35 finally appears to be on track. As tensions between the US, North Korea, and South Korea reach a fever pitch, military planners in Seoul are considering turning one of their small Dokdo-class helicopter carriers into an F-35B carrier. “The military top brass have recently discussed whether they can introduce a small number of F-35B fighters” to new South Korean helicopter carrier ships, a military source told South Korea’s Yonhap News Agency. South Korea operates a small but capable navy featuring a single 14,000 ton helicopter carrier known as the ROKs Dokdo. Seoul is planning to build an additional two ships of this type, with the next expected to be ready in 2020. My understanding is that work has now been completed. I haven't see any images to prove that but several reports from insiders have indicated all the weapons work for that max A2A config, minus to change to 6 internal AIM-120, has been done. A U.S. amphibious assault ship capable of carrying advanced F-35 stealth fighter jets was soon to arrive at Sasebo naval base in Nagasaki Prefecture, the U.S. Navy said over the weekend. The U.S. Navy’s 7th Fleet, based in Yokosuka, Kanagawa Prefecture, said the USS Wasp had entered waters under its area of operations and was heading toward Sasebo. The U.S. military plans to load F-35Bs deployed at U.S. Marine Corps Air Station Iwakuni in Yamaguchi Prefecture on the 257-meter Wasp and use them to deter North Korea and China, informed sources said. The Wasp was to come to Sasebo last autumn to replace the USS Bonhomme Richard, another amphibious assault ship, but its arrival was put off due to a post-hurricane relief mission off Puerto Rico and other afflicted areas. The 40,000-ton Wasp is essentially a miniature aircraft carrier. Built in the 1980s, the Wasp has been upgraded to deploy the F-35B — a fifth-generation fighter jet with vertical landing and takeoff ability that could offer the U.S. a major advantage in the event of a conflict involving North Korea as they have been deemed undetectable by Pyongyang’s air defense systems. The F-35Bs stationed at Iwakuni have been involved in recent shows of force, including joint training exercises between the U.S. and its Asian allies South Korea and Japan. The aircraft is currently tracking to reach its full program‐of‐record operational capability (Block 3F) in calendar year 2018. The full transition from legacy to F‐35 will complete with the transition of the second reserve squadron in 2031. With a mixture of 10‐ and 16‐plane F‐35B squadrons, the current transition plan allows MAGTF commanders the flexibility to deploy a 6‐plane MEU detachment all the way up to a full 16‐plane squadron. Our F‐35Cs will be able to deploy operationally with the Carrier Air Wing in support of Carrier Strike Groups in the early 2020s as well as to deploy in support of MAGTF commanders as a 10‐plane squadron. In 2018 VMFA‐121 will support a MEU detachment early in the new year, and VMFA‐211 will support a separate MEU detachment in the summer. Also in 2018, VMFA‐122 will execute its safe for flight as an F‐35B squadron at MCAS Yuma. In 2019 the Marine Corps will start to transition its first F‐35C squadron. VMFA‐314, currently an F/A‐18 squadron located in Miramar, will be redesignated an F‐35C squadron and remain in Miramar. The squadron is expected to train at a pace which will put them at a T2 rating by the middle of FY 2021, and they will start deployment workups by the end of 2021. VMFA‐225 is not far behind VMFA‐314, also transitioning from an F/A‐18 squadron, which will remain in Miramar, to F35‐B in in 2020 as well. VMFAT‐502 is currently planned to stand up in first quarter FY21 as the second USMC F‐35B FRS in order to meet the exponential increase in USMC F‐35B pilot training requirements. In order to support transitions to F‐35C, the Marine Corps has delivered eight F‐35Cs to the joint Navy/Marine Corps FRSs located in Eglin AFB and NAS Lemoore. The USMC is currently contributing F‐35C instructor pilots and maintainers at both locations to support training requirements." 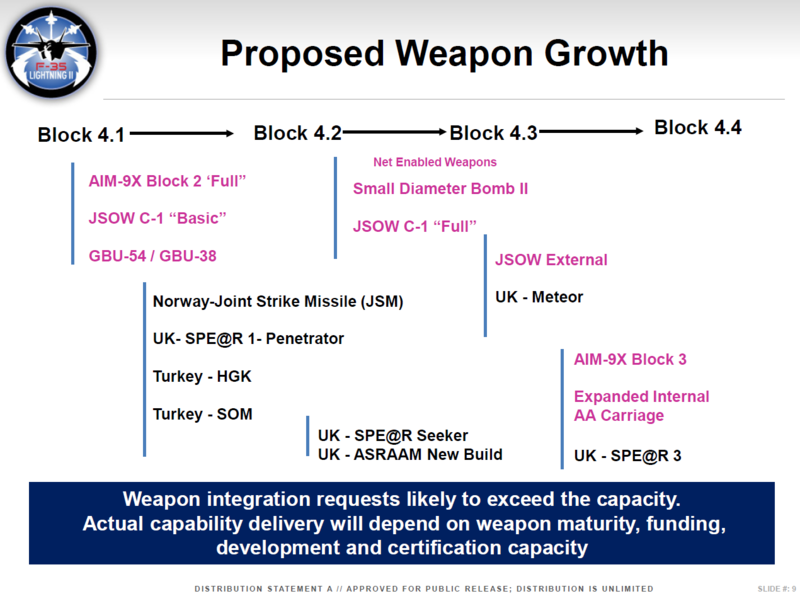 Lots more interesting info in the doc but the F-35 specific info are on slides 18-27. Modern warfare is waged largely on the electromagnetic spectrum. Although bombs and missiles get the headlines, they are just the kinetic step in a "kill chain" that relies heavily on electronic sensors and computers to detect, track, prioritize and target enemy assets. If the enemy is technologically advanced, it will be using its own array of electronic devices to deceive, disrupt or destroy attacking forces. These defensive measures will typically include methods for interfering with the electronic signals that smart bombs depend on for accuracy. The struggle to control and exploit the electromagnetic spectrum makes today's conflicts fundamentally different from those of the past. Although Sun Tzu understood 2000 years ago that success in war often depends on deception, the opportunities to confuse, disorient and demoralize adversaries have multiplied as the military enterprise came to depend so heavily on electronic tactics and tools. Electronic warfare thus is a central feature of military strategy for the foreseeable future. Which brings me to the Pentagon's biggest weapons program, the F-35 fighter. Begun at the dawn of the new millennium two decades ago, the F-35 program is providing the Air Force, Navy and Marine Corps with replacements for most of their Cold War tactical aircraft (nearly 300 have already been delivered). Three distinctly different variants of the plane will supply each service with performance features tailored to their unique requirements, in an exceptionally agile and versatile aircraft designed to be far more survivable than those that came before. Western news reporting on the Turkish news report from a few days ago. The newest version of the F-35 Autonomic Logistics Information System completed formal testing late last year and could be approved for installation at the first operational validation site in late February. Lockheed Martin, prime contractor for the F-35 airframe and for ALIS, confirmed to Inside the Air Force this week the latest iteration of ALIS software, version 3.0, completed formal testing ahead of schedule and is finishing flight tests at Edwards Air Force Base, CA. "ALIS 3.0 is currently wrapping up support of flight testing at Edwards AFB, and we will then seek approval to install to the first operational validation site in late February," Lockheed spokesman Nathan Simmons said in a Jan. 11 email. ALIS 3.0 is intended to support initial operational test and evaluation, which the program expects will begin this spring. Simmons said the company is currently working to certify the system's security and obtain "authority to operate" and connect across Defense Department networks. The program is working on a site-by-site release plan, Simmons said, but expects to roll out 3.0 to all service and partner sites by the fall, once the joint program office gives approval. In the meantime, Lockheed is still releasing the previous ALIS software, version 2.0.2, to users. Luke Air Force Base in Arizona and Italy's F-35 bases are the last operational sites to receive the upgrade. Although the program had expected to have 2.0.2 installed at all operational sites by the end of last year, Simmons said all upgrades should be completed in the next few weeks. Talk to any relevant fighter guy and that idea is laughed out of the room. Actually, the line from Full Metal Jacket is relevant here...."Choke yourself". Time marches on but the F-35 has yet to prove itself in real world scenarios. I'd love to see how the F-35 would compare to an updated F-14D or the Tomcat 21. Or what it will truly bring to the fight when called upon to haul iron 6+ hours one way. I fear a reality that we saw in 2001 when F-14As were leading the fight into Astan, not the F/A-18Cs.